From a play: Jezebel by Owen Davis, Sr.
Brilliantly staged and terrifically acted pre-Civil War melodrama, though the story might seem quaint to modern audiences. 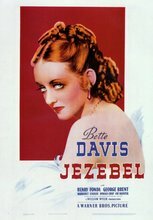 Bette Davis plays a Southern belle who shockingly challenges the social norm of her New Orleans elite society by attending a formal event in a non-white evening gown, then schemes to pit George Brent against her married ex-fiancé Henry Fonda. Brace yourself for an extended dinner conversation in which everyone at the table agrees that slavery is well and just. Oscars for Davis and Fay Bainter.